We know you are tired with so many newsletters from every corner of the world. You have developed sophisticated filters to keep most messages out. This time, please, just stay a bit longer with this information, delivered by Winmate, your old friend. The first rugged tablet pc powered by Intel ATOM. You might never be aware of what ATOM is. It doesn't matter anyway. Leave this job to us and we are pleased to tell you that we have successfully forge the number 1 rugged tablet pc by using the very best of what ATOM could provide. Let's say the power saving issue, efficiency, temperature, reliability, and all green concerns are all well considered and perfectly improved now. 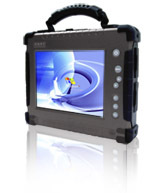 See more Rugged Tablet PCs video at our website. 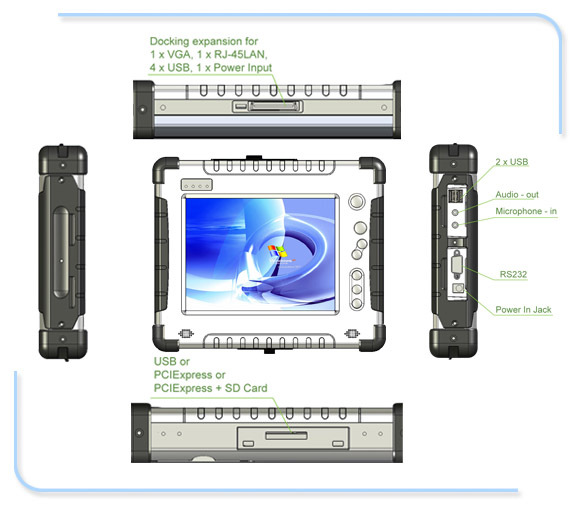 The 8.4"Rugged Tablet PC can support versatile IO functionality with 3x USB2.0 (one on top side), micro-in & audio out jack, 1x RS232. One high speed PCIExpress 34 standard can support you any kind of compatible external card such as GPS/ GPRS/ GSM/ UMTS/CDMA/ HSDPA communication module. Build-in Wi-Fi and Bluetooth making the Atom Tablet PC fully wireless. Reserved docking connector can help user to expand VGA, LAN and 4x USB when use at desktop. Meet MIL-810F reliability of the tough & ruggedness design, our Atom Rugged Tablet PC is your best choice for all kind of outdoor mobile application as field service, fire emergency, public safety, utility, medical and military. From the performance testing and 3D graphic testing, you can see how better performance & power saving the Intel new generation chipset can do! *All Rugged Tablet PC models use AMI System BIOS. *CF Card/ 2.5" SSD / 2.5" Automobile 40GB HDD (either one) , Only SSD or Industrial CF Card meet MIL-810F criteria. Our rugged vehicle mounting kit design can support universal arm mounting to fix in any transportation vehicle as heavy vehicles, forklift or police cars, etc.